Dr. Williams L Trotter, MD is a Doctor primarily located in Camarillo, CA, with another office in Ventura, CA. His specialties include Ophthalmology. He speaks English. Dr. Trotter has received 2 awards. The overall average patient rating of Dr. Williams L Trotter is Excellent. Dr. Williams L Trotter has been rated by 15 patients. From those 15 patients 6 of those left a comment along with their rating. The overall rating for Dr. Williams L Trotter is 4.7 of 5.0 stars. I've been a patient of Dr. Trotter for many years. He performed a successful cataract surgery on me and made me feel at ease through it all. Dr. Trotter thoroughly explained and educated me on any procedures I've had , as well as my progress on my annual visits. He is professional, personable, and compassionate. His warm smile makes you feel relaxed. Dr. Trotter is a top notch doctor that you can trust. My eyes are in good hands with Dr. Trotter. A wonderful experience pre and post op. A Stellar surgeon who cares sincerely. About your understanding of the procedure and will spend as much time as you need for you to feel totall comfortable with all aspects of the surgery. My experience and resulting 20/20 vision was more than I could of wished for. Dr trotter is a very skillful surgeon ! I was amazed with whole experience. I flew out from Florida to Calfornia for a week for this surgery which took about 20 minutes of operative time. I had total trust in his dedication to having me understand all aspects of the procedure per and post op the surgery. I was at awe how painless it all was. my vision was 20/20 as a result. I would highly recommend this surgeon ,by the he is my son! Take a minute to learn about Dr. Williams L Trotter, MD - Ophthalmology in Camarillo, CA, in this video. Dr. Williams L Trotter is similar to the following 4 Doctors near Camarillo, CA. 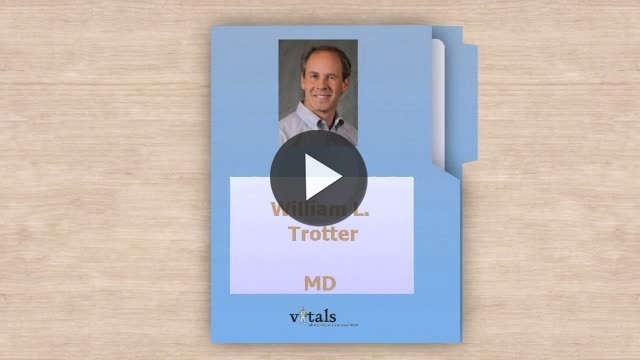 Have you had a recent visit with Dr. Williams L Trotter? Select a star to let us know how it was.